In this tab additional restrictions are set for the files to be scanned according to the scan mode. Files are selected for scanning in the Scan mode option buttons area. The All files option provides for maximum protection. This option is selected by default. 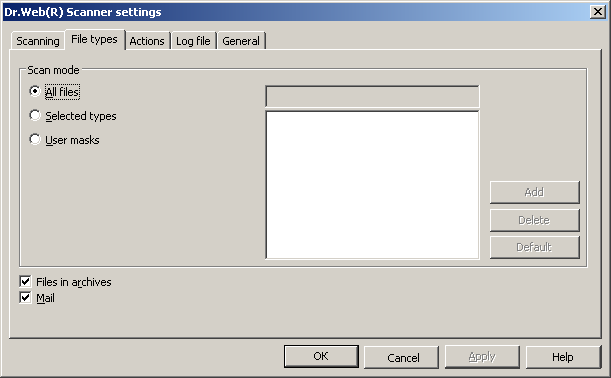 The Selected types and the User masks options instruct to check only those files whose extensions or names are included into the list specified in the right part of the pane. By default, the list includes the extensions of main file types, which can be virus carriers, and of the main types of file archives. The list can be edited. In this tab you can also specify if file archives and mail files are to be included in the scanning. By default, file archives and mail boxes are scanned. To view parameters set at another tab click the name of this tab.